"Robert Rose live is amazing! He has deep marketing expertise wrapped in an incredibly effective delivery style that creates a transformative experience for attendees. I highly recommend booking him as a speaker. Five stars." He combines his 25 years of experience as a marketing leader in both startup and enterprise marketing to deliver programs that are inspirational, thought provoking and leave audiences energized for your conference. 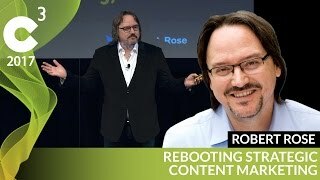 Whether you’re looking for a strategic keynote, a hands-on workshop, or Webinar presenter – Robert can keep your audience entertained as well as informed. If you’re interested in learning more about Robert, including his biography, you can find that here. If you’re interested in having Robert speak at your event, please let us know. Experiences: The 7th Era Of Marketing. The next evolution of marketing strategy is here. Marketing must adapt to be the strategic, differentiating function in the business. Learn how your business can move successfully into this new era. Managing Content Marketing The owner's manual for content marketing. Learn how businesses are applying the new methodology of content marketing to their business.